Manhole covers are made of cast iron. These covers need to be heavy so that when vehicles drive over them, they do not become dislodged. Manhole covers normally weigh 100+ pounds each. Some have open pick holes which allow water to enter the manhole. Others have concealed pick holes which do not go all the way through the cover or lift handles such as drop handles or ring handles. Manhole covers can be bolted to the frame for security reasons. Manhole covers can also have a gasket on the bottom of the cover and bolted to the frame which is normally considered watertight. 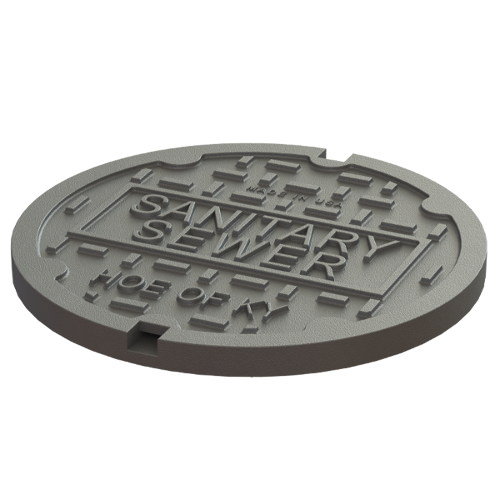 Manhole covers provide entry to an underground world of sewers, water mains, power/communication lines, conduits, etc. Manhole covers are a form of art. They are normally lettered ‘Sanitary Sewer’ or ‘Storm Sewer’ but can basically be lettered anything. Manhole covers have different patterns/designs on them and even custom logos if a city desires. Look down next time you are walking through a city and take note. Why are most manhole covers round? Manhole covers are round because a round cover cannot fall through its circular opening. The manhole cover rests on the frame seat; therefore, the diameter of the frame opening is smaller than the manhole cover. 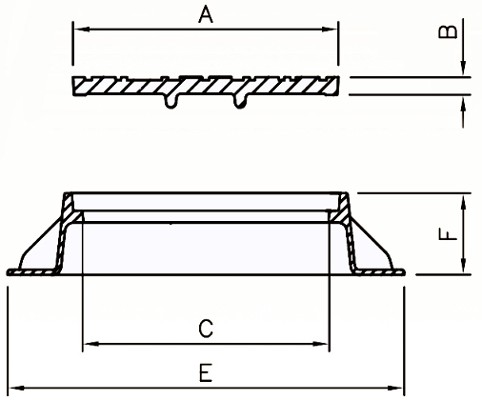 Whereas a square or rectangular manhole cover may fall through an opening if turned diagonally in the hole. It is also easier to dig a circular hole. Round covers are easier to machine on a lathe. A round manhole cover can be rolled, which makes it easier to move if needed. J. R. HOE & Sons manufactures gray iron and ductile iron manhole covers and frames at their Middlesboro, Kentucky facilities. J. R. HOE & Sons stocks all the regional standards at their Louisville, Kentucky sales/distribution yard as well being the exclusive EJ distributor. J. R. HOE & Sons can manufacture or supply one to thousands of castings for your projects. If you are looking for a custom cover or custom grate, J. R. HOE is your source.